STRONG global demand for Scotch whisky caused exports to jump dramatically in the third quarter of 2017, writes Leon Kuebler for WhiskyInvestDirect. According to official figures published by HMRC, more than 105 million Litres of Pure Alcohol (LPA, standard industry unit) of Scotch were shipped overseas between July and September 2017 – the equivalent of 375m standard 70cl bottles at 40% ABV – with a total value of more than £1.3bn. Compared to last year’s figures, the total volume of Scotch exported worldwide in 2017 Q3 increased by 13.0%. The overall value of these shipments grew at an even faster rate, rising 22.6% year-on-year. Nine months into 2017, 252.8m LPA of Scotch, worth £3,077.6m, have been sent abroad. As a result, Scotch whisky is now on course to break its record for exports in a year. The largest quantity of Scotch shipped overseas was 344.1m LPA in 2013, while the most Pounds earned in a single year from Scotch exports was £4,272.8m in 2012. For Scotch to have a record export year in 2017 a total of 91.4m LPA, worth £1,195.2m, would need to be dispatched worldwide in Q4. This would be achieved even if Q4 exports declined by 4.3% in volume and 2.2% in value from their 2016 level. The global popularity of Scotch whisky was illustrated by the growth in shipments to all major regions in Q3. Of particular note was Singapore, Scotch whisky’s third largest market, as the value of Scotch exports there rose by 74% off a 44% increase in volume over this three-month period. In recent years single malt has proven the main driver of Scotch’s export growth, topping £1bn for the first time in 2016. This strong performance continued in Q3, with shipments of single malt growing by 10.4% in volume and 14.5% in value on 2016. But blended Scotch in bottle, which accounted for 68% of all shipments in 2016, performed even better, rising 15.6% in volume and 28.4% in value. These numbers suggest that global exports of Scotch whisky, which returned to growth in 2016, are continuing to perform well in 2017. At the same time, Scotch is unlikely to continue growing at such a high rate in Q4. Q3 exports have not seen such growth rates since 2011, when shipments grew by 16.2% in volume and 25.3% in value. 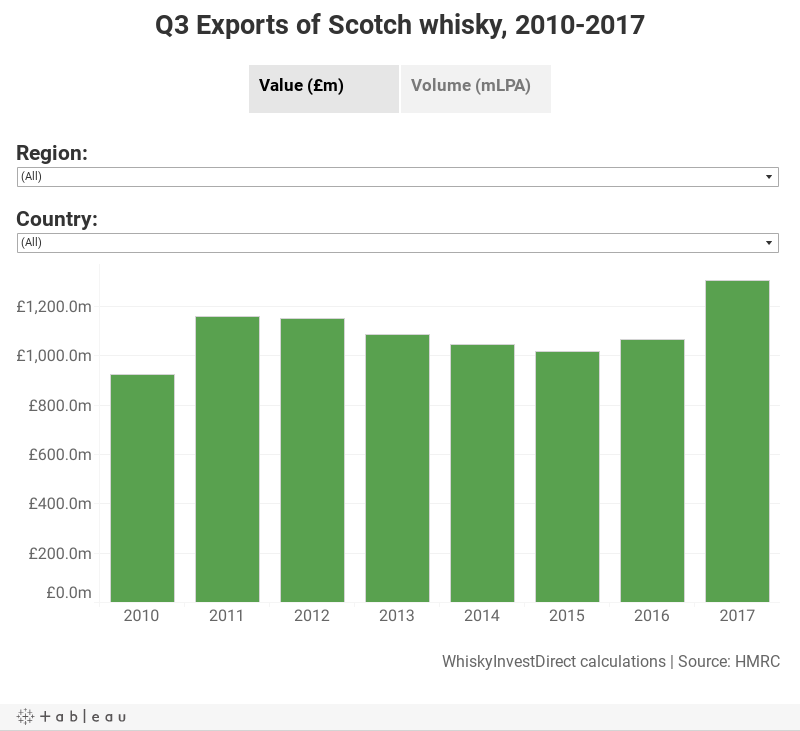 It is also only the second time that Scotch exports have posted a double-digit upswing in both value and volume terms since 2012, with the last instance happening in 2013 Q2. Indeed, if we were to take the increase of 4% in volume sales off a 5% rise in Scotch whisky revenues reported in July-December 2017 by Diageo, the largest producer of Scotch whisky in the world, worldwide exports of Scotch will have actually declined by 10.3% by value and 4.7% by volume in Q4. Given Scotch’s recent performance over the last two years, a Q4 decline of this magnitude seems improbable. A more likely explanation for Q3’s historic performance is that it included shipments which would have traditionally occurred in Q2. After all, Q2 2017 witnessed a decline of 2.4% in value and 6.4% in volume on 2016 after exports had surged in Q1 2017. In contrast, the growth in Q3 exports was largely attributable to huge year-on-year increases posted in July (up 36% in value and 29% in volume on 2016) and August (30% and 13% respectively). By September 2017, year-on-year growth had returned to levels of 7.3% in value and 0.6% in volume – still respectable, but much more in line with recent years. The full 2017 export figures are due to be published in February 2018.